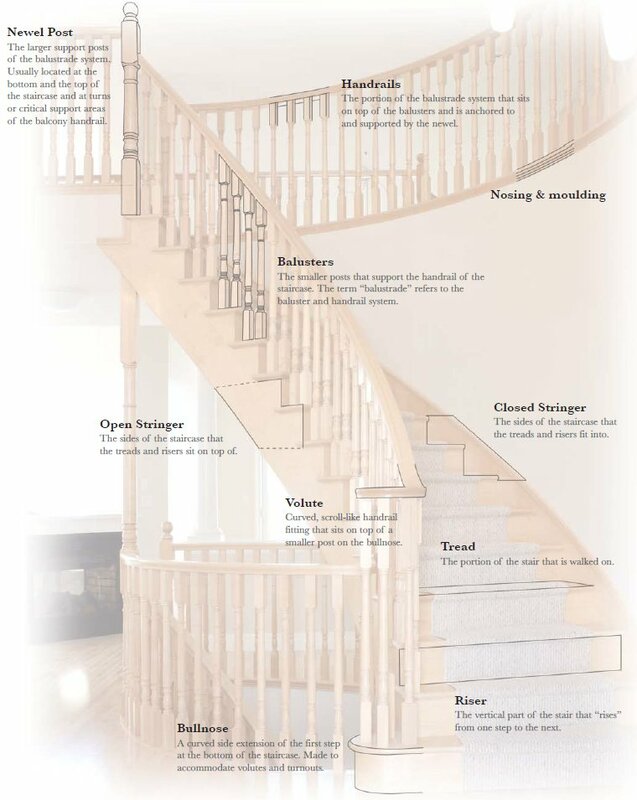 For your reference, below you'll find a list of stair terms to help us speak about your staircase. Baluster: The smaller posts that support the handrail of the staircase. The term “balustrade” refers to the baluster and handrail system. Bull Nosing: A curved side extension of the first step at the bottom of the staircase. Made to accommodate volutes and turnouts. Cove Molding: A decorative strip of trim attached to the underside of the tread nosing to cover the joint between the tread and the risers and to add decorative detail. Fittings: The parts of the handrail system used to form a smooth transition when the handrail changes height or direction (e.g. volutes turnouts, upeasings, goosenecks). Handrails: The portion of the balustrade system that sits on top of the balusters and is anchored to and supported by the newel. Newels: The larger support posts of the balustrade system. Usually located at the bottom and the top of the staircase and at turns or critical support areas of the balcony handrail. Rail Nosing: A trim piece that runs along the floor for the insertion of the balusters. Riser: The vertical part of the stair that “rises” from one step to the next. Soffat: The finished wood underside of a stair. Stringer: The sides of the staircase that the treads and risers fit into. Tread: The portion of the stair that is walked on. Tread Nosing: The Front Portion of the tread (lip) that protrudes beyond the face of the riser. Volute: Curved, scroll-like handrail fitting that sits on top of a smaller post on the bull nose. Winder Box: A series of treads (2-3 treads) that turns the stair, typically a 90 degree turn.